Noshok® Type 300 bimetal thermometers are high quality and have a corrosion-resistant 304 stainless steel case and bezel that provide a hermetical seal to prevent lens fogging and moisture damage. They are ideal for construction applications where on-the-job piping requires reading the instrument from different angles. This includes industrial process, petrochemical, food processing, commercial, and wastewater applications. 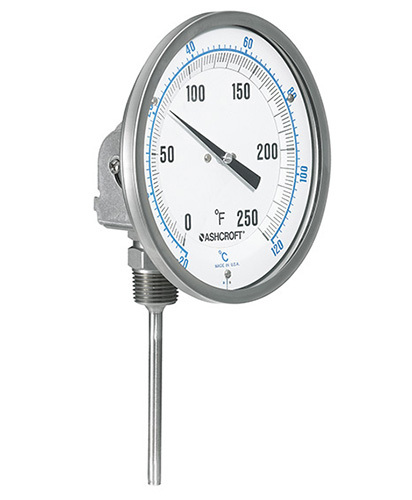 Weksler Glass® Type 3BKE bimetal thermometers are versatile and back connected, and have easy recalibration adjustment. They have all welded 304 stainless steel construction and are sealed to exclude dust, dirt, and moisture. Weksler Glass® Type 3BM bimetal thermometers are versatile and bottom-connected, and have easy recalibration adjustment with an Allen Head wrench. They are hermetically sealed with all welded 304 stainless steel construction.